There is a gang of somewhat revolutionary L&D (learning and development) professionals in the UK -- I think they're in the UK -- who are working to introduce new ways of thinking about learning in organizations. They have worked together as the Internet Time Alliance. Given that traditional corporate training and professional development doesn't seem to be having the impacts it should have, especially given the financial resources typically poured into it, rethinking the entire approach makes sense. In fact, everything Jay Cross has ever written makes a great deal of sense to me. I'm also a fan of other members of the gang (Jane Hart, Harold Jarche, Charles Jennings, Clark Quinn), their blogs, courses and books. Sadly, Jay Cross passed away in 2015. I like the idea of a small group of practitioners working together at times and individually within an informal alliance. It appears to have the flexibility that I would be looking for in working as a solo consultant, but with peers when it makes sense. It's also different from developing one-off relationships with fellow solo consultants for the needs of a specific contract. 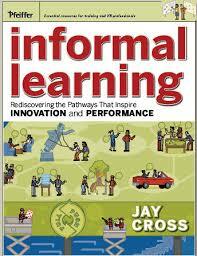 The book goes into all the different ways that we can think of individual learning within an organizational context. I like all of it, really, but I'm a little nerdy, so I really liked the glossary. For example, I was re-reading Chris Argyris on double-loop learning and trying to come up with a simple definition. I was over-complicating it and here it was, a simple definition of double-loop learning in the glossary of this book. More broadly, this book is an excellent way to approach thinking about individual learning in organizations and can help build a bridge between individual learning, team learning, and ultimately, the culture of learning that is needed for successful organizational learning. Check what the Internet Time Alliance is doing these days...latest blogs, books, events. Prepare a module (set of slides/stories/images/quotes) on Informal Learning and Personal Knowledge Management.